Mountain of a Million Daffodils! “Born” in 1993 as a project of SI Running Springs (which later merged with SI Lake Arrowhead to form SI Rim of the World) the Mountain of a Million Daffodils project has resulted in close to a quarter million daffodils being planted in our mountain communities. We are not yet at our million mark, but if anyone can soar to that goal, the SIROW team can! SI of RS started the project to help beautify our mountain and put a smile on travelers’ faces. The group would plant half of the bulbs and sell the other half to help pay for the ones planted. It started off small and over the years really grew. Every year we plant at least two cases at sites yet to be determined. King Alfred daffodil bulbs, hardy for our high mountain altitude and occasional snowfalls, are packaged and sold in groups of 25, 50, 75, 100 and by the case of 200. And even better, these bulbs are very unappetizing to gophers and deer! Prices include CA state sales tax. Make your check out to SIROW. bulbs are a popular item in neighborhoods, shopping areas, and homeowners’ associations. The 2018 bulbs are due to be delivered in mid-September. We are taking pre-orders now. When you get your King Alfred bulbs, make sure you that you store them in a cool place away from the sun. Do not put them in your refrigerator, as it will dry them out. Plant your King Alfred’s in late fall when the weather is much cooler and before the first frost. Plant them about 6 inches deep and 6 inches apart. Do not separate the bulbs if they are together. Our daffodils are hardy for our mountain climate and great around other flowers because the gophers and other animals will stay away from them. So be sure to place your orders early – we cannot make an additional order after these are sold out. Give your neighbors, your favorite merchants, your church, etc. an opportunity to make a bright spring display, improving the beauty of our mountain community and at the same time providing valuable services to our area residents. 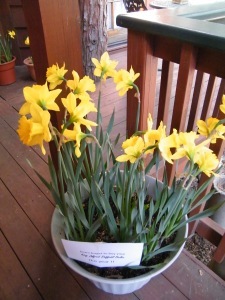 Now taking orders for the Large King Alfred Daffodils. Make sure to place your orders early as these are very popular.